Reception and Class 1 and 2 treated us to a great song this morning, telling the story of the animals in the Chinese Zodiac. 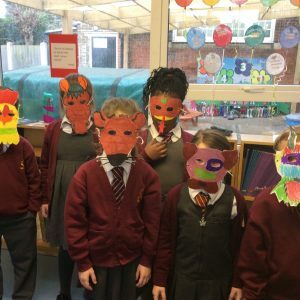 They made masks and are having a Chinese food tasting session this afternoon. We have been talking about Justice in collective worship and in Class 5/6 R.E sessions this week. Two of our girls attended the Women’s March last Saturday and shared their experiences with us. 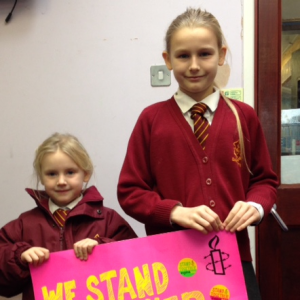 It is great to see that our children care about and are willing to stand up for people’s rights. Please could all girls who go swimming please wear socks rather than tights on swimming days. This is because the children are no longer allowed to put their shoes and socks on in the changing rooms and it is not really appropriate to put tights on in a public space. Our school nurse will be holding a drop-in session from 8.30am on Thursday 2nd February. These sessions are for any parent who has health concerns about their child and would like some advice. Please do come and see her if you have any concerns. Our online payment system should be up and running soon. You will each receive a letter to inform you of your account and log-in details. In the meantime, please continue to buy dinner tickets for KS2 children. Commendations this week went to: Miller Davis, for his rainbow writing invitation ; Katie Snow, for sounding out in her writing ; Neli Higgins, for earning the most ‘Dojo’ points in her class ; Abigail Lee, for her caring and friendly attitude towards her friends ; Oliver Mahoney, for great Art work this week ; Ella Murch, for fantastic, confident reading this week ; Hermione McCormack, for always having a fantastic attitude towards her learning and Sadie Turrell, for working very hard to become more confident with telling the time. Well done, everyone! Reception : Alicia Moran- excellent writing when re-telling the story of the Rainbow Fish. Class 1 and 2 : Tom Marshall- fantastic sentences in his Chinese zodiac story. Class 3 and 4 : Lexi Webb- putting incredible effort into her funny poem. Class 5 and 6 : Harry Newman- extraordinary work multiplying and simplifying fractions. Pen licences were awarded to Scarlett Blackshaw, Harry Newman and Tommy Randall for consistently neat, cursive writing.